The Ohio Donut Trail has not been without trials and travails. Mostly, it has involved insane levels of donut consumption and a few double dog dares. During the first donut tasting party someone started a conversation that turned into a culinary quest for me. It goes like this. A cronut is a glazed croissant from Auddinos. It is absolutely fabulous. 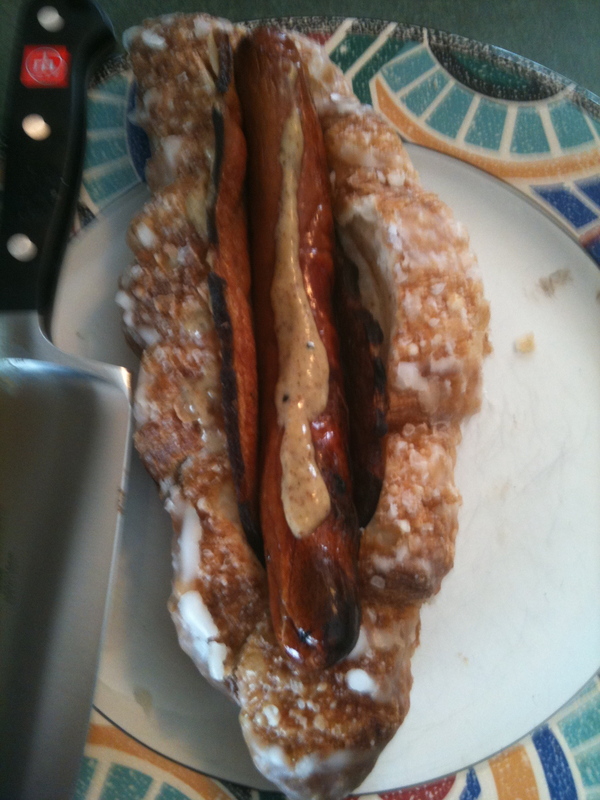 It serves as the base of the Cronut dog. So, step one. Go to Auddinos and purchase cronuts. The vision for the cronut dog was a hot dog served in a cronut with bacon and spicy maple mustard. This is how everything went down. I purchased double smoked bacon at Bluescreek Farm Meats at the North Market. I picked up two hot dogs from them as well. Their bacon is fantabulous! My house smelled like it for four days. I did not have any Twixlen Brand Spicy Maple Mustard so I concocted my own on the spot. I have 10-12 mustards in my refrigerator at any time so this was not so hard. To make this an all Ohio mustard I took two parts Bertman’s Ball Park Mustard, one part Stadium Mustard and Ohio Maple syrup (to taste) then mixed them together until I found the flavor profile I thought would work. I cooked two long strips of bacon, leaving the bacon pliable enough to wrap around the hot dogs. I then boiled and grilled the hot dogs (this is the proper hot dog cooking technique observed in my household). I did not have a good way to steam the cronut (a hot dog bun should be steamed) because I would lose the sugary glaze in the process so I just cheated and nuked the suckers. I put all of this together and …BEHOLD! The First Cronut Dog. I was wary but it was good enough to eat. I ate the whole thing. Nothing bad happened. Really. This is what I hope to do differently on the next trial. I will use Five Star Hot Dogs (from Cleveland) or Nathan’s Hot Dogs because I think their casing and spicing will work better with the spicy maple mustard. I will also deeply split the cronut then lightly grill / sear the inside, leaving the glazed outside intact but a bit gooey. I will then cut the finished product into bite sized pieces and tooth pick them together to serve as appetizers. Lesson: don’t double dog dare me, I will so do it!